Students receive £2,250 for an 8-week placement to cover their expenses. Download our booklet of success stories. There’s simply no better way to gain new skills and unrivalled insight into the world of work than through the SEPnet Summer Placement Scheme. With bursaries available, it’s an invaluable way for physics undergraduates to gain work experience over the summer holiday period, in either a commercial company or research institution. A wide range of organisations are already involved offering placements in a variety of physics disciplines. Students have enjoyed placements with QinetiQ, the National Physical Laboratory, Symetrica, the Culham Centre for Fusion Energy, the Met Office and many other employers. As well as working in industry, you can undertake research work in a SEPnet university (at which you are not a student), the Rutherford Appleton Laboratory and other research institutions. In the winter term SEPnet holds a Students’ Expo in London. Sharing a poster session and giving a short presentation about your placement provides a valuable opportunity to hone your presentation and communication skills. The scheme is only for physics undergraduates on Year 2 BSc/MSci/MPhys programmes and Year 3 MPhys/MSci programmes at SEPnet partner universities (Hertfordshire, Kent, Open, Portsmouth, Queen Mary, Royal Holloway, Southampton, Surrey and Sussex). Year 2 Environmental Physics students at University of Reading are also eligible to apply. Year 1 SEPnet students are eligible to apply with permission from their Heads of Department. NB: YOU CAN ONLY CARRY OUT ONE SEPnet SUMMER PLACEMENT PER YEAR. SEPnet PhDs and students who have confirmed PhD or MRes places at a SEPnet university beginning in 2018 are eligible to apply for some placements. You will need to register your details when you apply for a placement so we can keep in touch with you and ensure you understand the terms and conditions. You will not be able to take up a placement until you have registered. 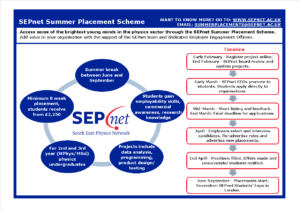 If you are an eligible student, contact your SEPnet Employer Engagement Officer or email summerplacements@sepnet.ac.uk if you have any queries. 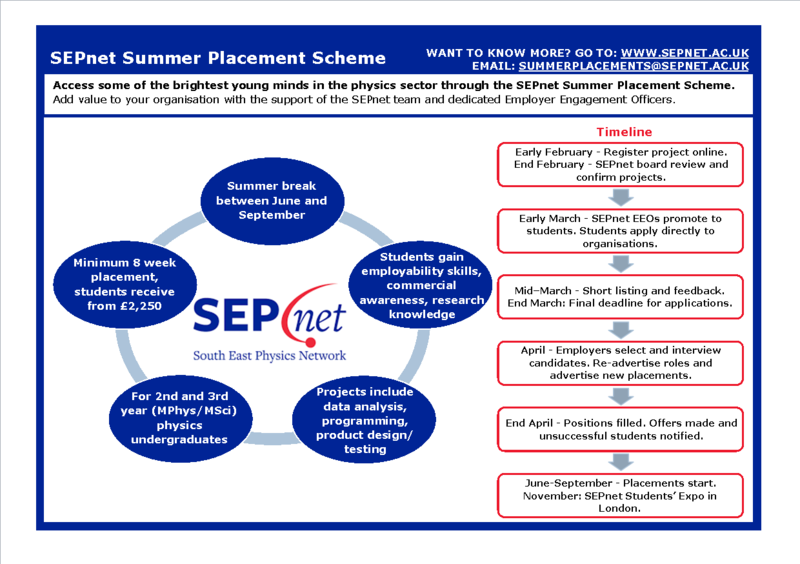 For an overview of the timelines involved in the summer placement scheme please see the Quick Guide to the right. The individual organisations review the applications and will get in touch with you direct if they wish to offer you an interview. Unfortunately, we can’t cover travel expenses for interviews but organisations will usually cover this. All placement opportunities are filled by May. Is there any help with accommodation? We advise students to consider placements near to their university or home if possible. If you are successful in securing a place and need to rent accommodation, you can ask your placement organisation for advice on where to find accommodation or try the following websites: http://www.unihomeswap.co.uk/ or www.spareroom.co.uk. StuRents advertises properties in several regions throughout the UK (https://sturents.com/) and lists a wide range of summer lets. It offers a live support service during the day to help students find short-term accommodation over the summer period.